"Exit Six: JUST ENOUGH ROPE"
an exhibition of new paintings by Chris Kienke. Chris Kienke "Just Enough Rope" 2014 Photo and Acrylic on canvas. 32"x41"
With "Exit Six: JUST ENOUGH ROPE", Kienke continues to deal with our choices to go a certain route or another in our lives. He deals with our identity and with our inner conflicts. 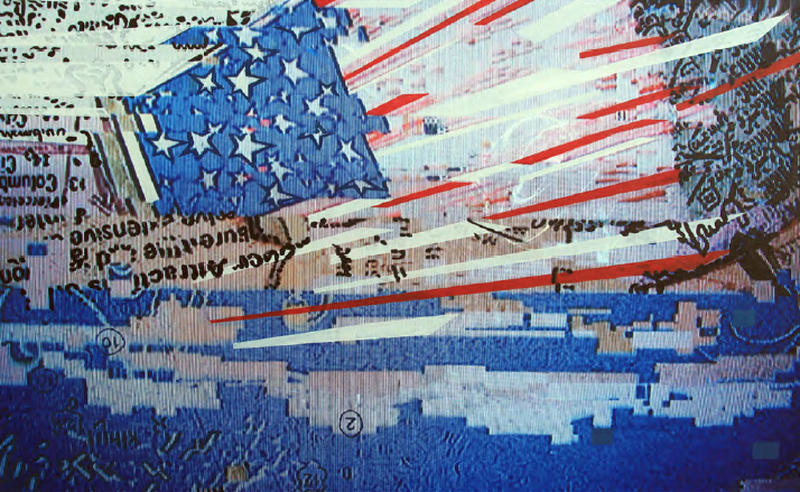 Inspired and being engaged with images of canonic “American Hollywood” that portray, mostly, the fringes of our society, and particularly with images that have been distorted due to a glitch in the electronic signal between the DVD and the television screen, Kienke goes further and expands the meanings and conversations, both contextually and visually , by blurring the departure point of the image he captures from the TV screen, printing it on a canvas, and paints on top of it, obscuring and revealing certain parts of the original image. With Kienke’s characteristic aesthetic fluency, these “tele-visual” images integrate old and new technology, challenging traditional notions of painting and situating this work within discourses on contemporary society and its relationship to technology. Through this “post-analog” approach, the artist questions the demarcation between notions of reality and virtuality as they inform and influence the creation of cultural identity. Kienke is interested in how the visual languages of film and television inform the creation of an individual’s beliefs and sense of identity giving them just enough rope to deal with the inevitable consequences of their behavior. Born in Rochester, New York, Chris Kienke’s work has been exhibited in over 70 shows including recent solo exhibitions at the University of Kentucky (2016), the Art Center at National Central University in Taiwan (2015) and the University of Wisconsin in Osh Kosh (2014). Kienke exhibited in the Florence Biennale in 2011, the Brussels Biennial in 2009 and was included in New American Paintings in September 2009. Kienke has been a fellow at Hospitalfield House in Scotland in 1998-1999 and at the Vermont Studio Center in 2003 and 2007. His work is in the permanent collections of ABN Amro Bank in Dubai, Savannah College of Art and Design and the United Kingdom National Collection. Kienke received his MFA from Southern Illinois University - Carbondale in 2000 and his BFA from the Kansas City Art Institute in 1994. He is on the faculty of the School of Art and Design at the University of Illinois at Urbana-Champaign.